Books beyond the best-seller list. Interested? Join this thought experiment. This leads me to a thought experiment, and I need your help. 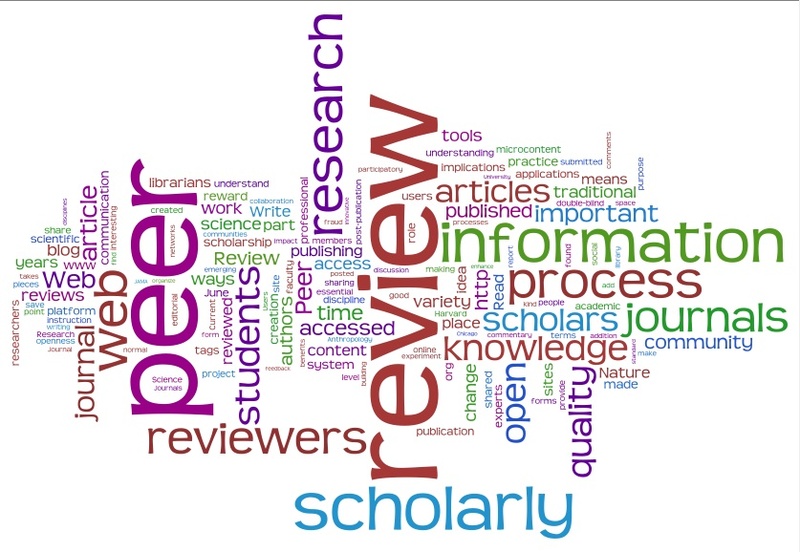 I would be grateful for responses from anyone interested in the future of the scholarly monograph….not in the future of writing and publishing scholarly monographs, but in the future of browsing and reading them. In short, I want to crowdsource some ideas about an ideal future state for the book that is not “commercial” in that it is not going to land on the New York Times bestseller list (99.9999% of books, including those upon which trade publishers pin big hopes and equally large advances) but also in the sense that its prime purpose is not to be purchased by a large enough number of readers to generate profits that will cover its traditional cost, but rathter just to say something worth saying. I really liked these choices that were made at the AMNH. 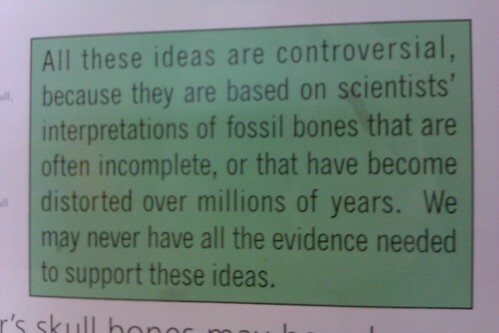 They presented a strong point of view on an issue about which there is some controversy (the relationship between dinosaurs and birds), presented it as a point of view, but also didn’t suggest that any opinion on this issue is therefore equally valid – awesome dinosaur bones plus an expectation that viewers are smart enough to consider questions of evidence in a sophisticated way. I’ve had an iPad, like many others, for something more than a month now. I haven’t talked about it much because I just haven’t been interested in justifying the purchase, or answering questions about whether it was worth it. Like the first post I just linked to says, I’m think the answer to that question is still evolving even as I notice myself doing familiar things in new ways. But I went to a conference last week, which was not only my first iPad travel experience, but it was one where I decided to see if I could get by with just the iPad, even though the presentation wasn’t done when I got on the plane and I had a bunch of resources I wanted to bring with me. ….Probably someone had investigated the phenomenon; no doubt she could look it up on the wrist. She tapped out the code for the Journal of Areological Studies, typed in Pavonis: “Evidence of Strombolian Explosive Activity Found in West Tharsis Clasts.” “Radial Ridges in Caldera and Concentric Graben Outside the Rim Suggest Late Subsidence of the Summit.” She had just crossed some of those graben. So, this picture has always sounded pretty good to me. The ability to carry everything I might need and get at it whenever I have a question – that’s a type of heaven that connects me back to my very first smartphone purchase in 2005 which was justified by my desire to access IMDb from any pub in America. Though, I have never been able to picture what the displays on the units in the quotation above (from Blue Mars) must look like that they let you read any kind of document, ever, on a unit you wear on your wrist. 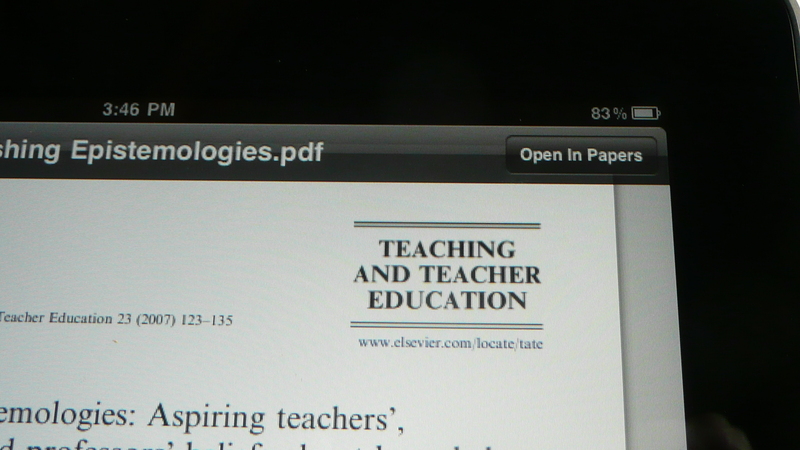 Now I didn’t buy the iPad thinking that it would bring me into the world of ubiquitous scholarship – but as I started to prep for this conference I decided to see how close it would get me. I brought a pretty big folder of articles and other documents along with me and found myself able to use them as much and as easily and I wanted to thoughout my five days on the road. For articles, I was using this app – Papers. I don’t have the desktop client installed. When I first installed it on the iPad, I did so because the description said that the desktop client wasn’t necessary to use it – but that wasn’t true then and given that this app is definitely not free, I wasn’t happy. A recent upgrade changed things, though and while I think this application would be a lot easier to use if I did have the desktop client, my experiment in using it without was successful. 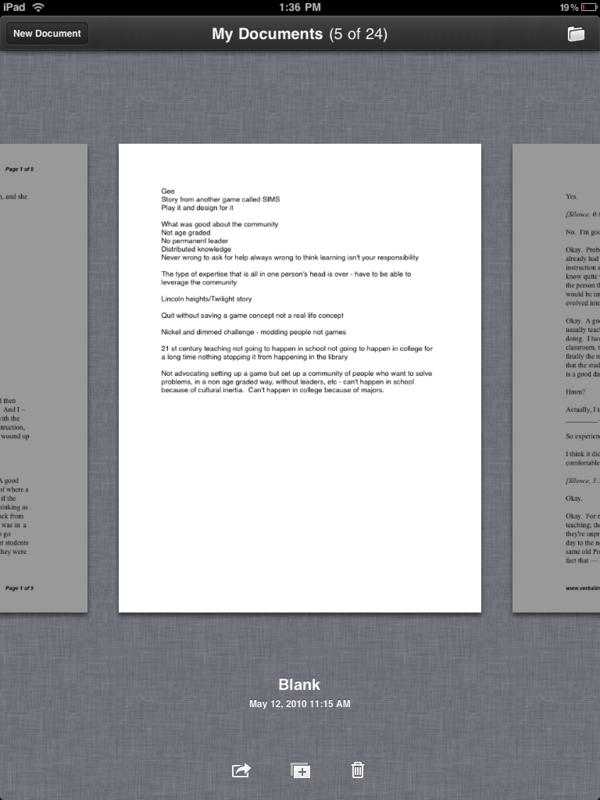 Here’s the PDF waiting in my email on the iPad. 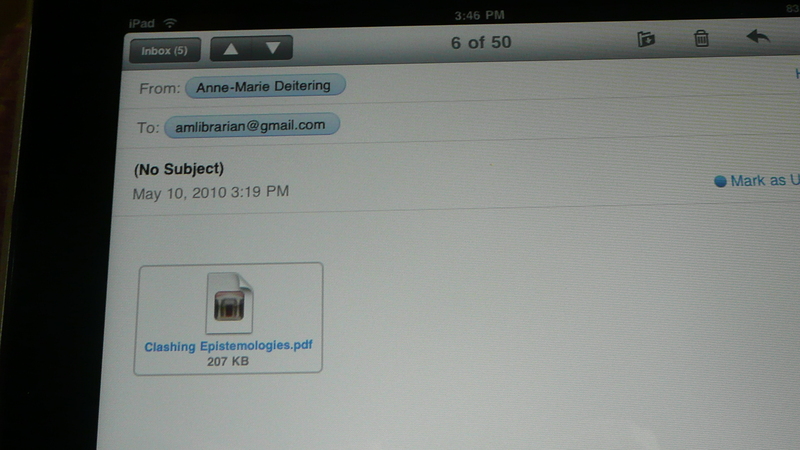 Click the icon to open it, and within the email client, I get button with the option to open the document in Pages. Once in Papers, it gets a little clunkier. If I had the desktop client, it would move everything over with metadata intact. As I don’t – to add this I need to add the metadata myself — if I care to have it. I don’t use this program (nor, I suspect, will I) to manage my citations so I haven’t figured out yet if I care about having the metadata beyond a descriptive title. 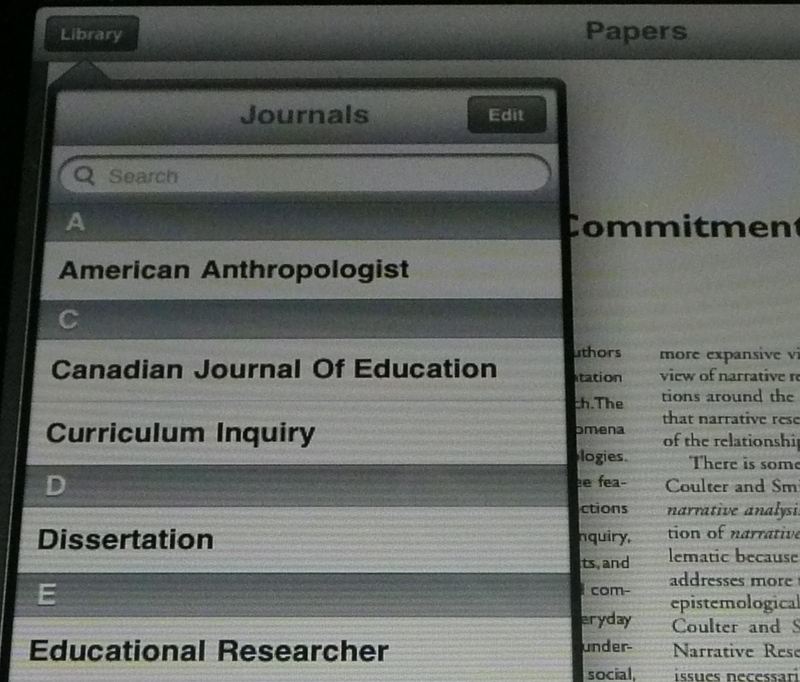 The journal name is easy to add, especially if you already have articles from the journal. 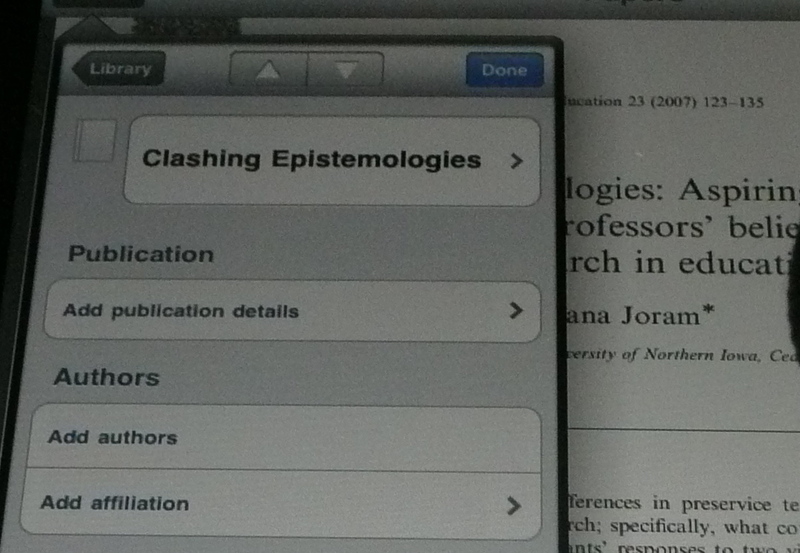 I can see the utility here, if I wanted to browse articles from a particular journal maybe? I bought and installed the Keynote application on the iPad right away. I use Keynote all the time – even when my documents are going to end up as PowerPoint, I create them in Keynote and convert – that’s how much I love it. Pages, on the other hand, I have never warmed up to. I hardly ever use it. But, at the last minute, I decided that I also wanted to bring along several dozen interview transcripts. I installed the Pages application as an experiment to see how this would work, and opened my email. I was pretty surprised when the documents (which were Microsoft Word documents) displayed a Pages icon as soon as I had it installed. 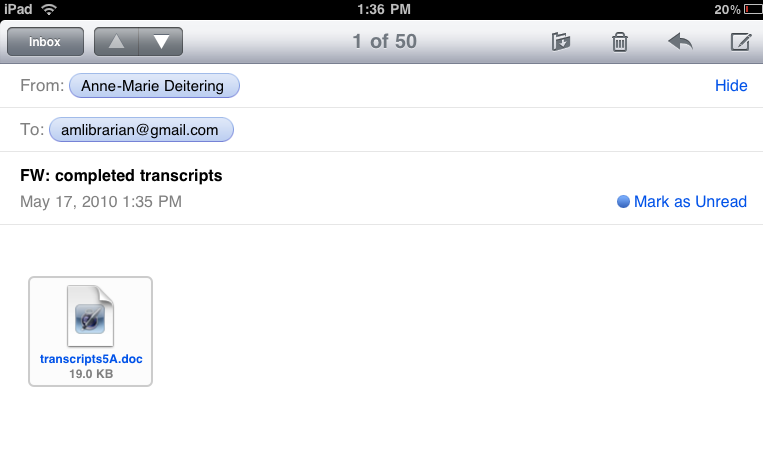 Click the icon, open in Pages and I had access to all of my transcripts with practically no effort. So neither of these are free applications – Pages costs $10 and Papers $15.00. For that $25, though, I was able to carry about twenty transcripts, a couple of dozen research articles and the full scan of a dissertation that I really didn’t want to carry. Plus the movies, books, photos and music I need to survive the hours and hours of airplane time it takes to get back to Oregon from the east. It’s not a research library on my wrist yet, but I can see the way there. This blog will never die. It will never die because of this post. Written in, I think, in about 15 minutes this post was just a quick thing to share a new tool that I was (and still am) really excited about. And I’m not the only one. So I never expected that this post would have more legs than any other post I’ve ever made – it doesn’t have the highest hit count, but of all of the posts on this blog it is the tortoise-est one. Every day it picks up one or two or three views. Unfortunately, those views come from people who are looking for something else. Well, I shouldn’t say “unfortunately.” I suspect a decent number of those people have never seen Wordle, and think it’s pretty cool. So it’s cool by extension that they see that post here. But they come here looking for (and this is almost always the exact wording of the search, it’s weird) – “words that mean pretty.” So, they want synonyms for the word pretty. I’m thinking that they know what pretty means, and that they want some other words that mean that same thing. So there are a couple of information literacy issues here, right? The first, and probably most obvious, is that entering keywords into a search engine is not the best way to answer this particular question. There are better tools out there. #1 – this one seems like it might be relevant, but it is actually a dictionary page for the word perhaps, not the word pretty. #2 – this is a Yelp San Francisco query looking for non-english words that mean pretty. #6 is a link to the lyrics to Dirty Pretty Words. #7 – we finally get a result that might work. It’s a WikiAnswers question that just says – “words that have pretty much the same meaning.” But the description says “other words for pretty, same meaning as pretty” and so forth. But when you click through to the page, you don’t see those questions. Instead, you find out that the initial question was looking for a definition of the word “synonym.” Still, asking the question on WikiAnswers would probably work. And then my post at #8. Not that I really have to convince anyone who reads this blog that a search engine isn’t the place to find synonyms and antonyms. So the first information literacy issue is a tool issue – there are things called thesauri and they can be really useful! Check them out. Which connects to the more subtle information literacy issue here. Which goes beyond how search engines aren’t a great starting point when you’re trying to find or generate synonyms – to finding and generating synonyms is a pretty fundamental part of effective keyword searching in search engines. If you understand how keyword searching works, you know that the search words that mean pretty will bring back anything with the disconnected terms words, mean and pretty. Which as the result list above indicates, is a whole lot of stuff you’re not interested in, including a random blog post about Wordle. So when you get that result list, if you know how keyword searching works, you can troubleshoot that search and say “hey, I think I need a more specific term to get at the concept words that mean.” If you’re really savvy at that point you might get the word “synonyms” from the WikiAnswers result and re-search using the terms synonyms and pretty. That search works – you get result after result listing other words that mean the same thing as “pretty” does. But here’s the thing – a lot of people don’t know how keyword searching works, in search engines or elsewhere. Or they maybe kind of know, but they don’t really think about it. And they don’t know how to troubleshoot that first failed search, or to find synonyms that will work better. So I went looking – what would work better? Because, as it happens, I’m working on a new keyword assignment – that I started talking about a few days ago, and that Sara talked about here – for beginning composition that will try to get at some of these issues about keywords and how they connect to critical reading, writing, thinking, as well as searching. Lexipedia: Where Words Have Meaning: This one is interesting – it is based on the WordNet project at Princeton, and it creates, fairly quickly, cool webs of related words — synonyms, antonyms, fuzzynyms and more. The webs are color coded so that you can glance at them and know that synonyms are olive green and antonyms are dark red. The site looks a little bit messy, and it is hard to find. While it has the domain “lexipedia.com” – a search on “lexipedia” brings back a lot of references to another project, about Wikipedia and handhelds. Still, this one works pretty fast, provides a lot of terms that might be useful, and I like the glanceability of it. And for the more textually oriented, there’s Definr, that also uses the WordNet project data. Interestingly, it’s main selling point seems to be speed. And it does define words really, really fast. Not surprisingly, given the source data, it also provides some synonyms and related terms. Both definr and lexipedia are user interfaces on top of the data generated by WordNet at Princeton. This project, which groups words into “sets of cognitive synonyms” has about a million related projects listed on its website. And the idea of cognitive synonyms is interesting, right? For thinking about connecting terms to concepts and troubleshooting searches? And now, as a bonus librarian answer – according to the OED, the first definition of the word pretty (adj.) is “cunning,” “crafty” (originally), and “clever,” “skillful” or “able” (later). It was first used in this way in 1450. “Aesthetically pleasing” is the second meaning, and it was first used this way about 10 years earlier. “Sitting pretty” dates back to 1915, in Lincoln, Nebraska and “pretty please” dates back to 1891. This is the paper Kate and I submitted along with our LOTW presentation, rendered into this gorgeous tagcloud by Wordle, a new tagcloud generator I saw today on Information Aesthetics. I love tagclouds anyway – but this one lets you play with layout, fonts and colors in a way I’ve never seen before. You can upload or copy and paste any text, or hook it into a del.icio.us account as a new way to see those tags. So much fun.